More heavily biased reviews for your reading (dis)pleasure. 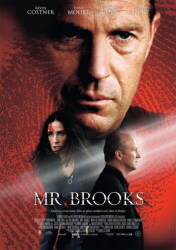 Kevin Costner plays the role of the family-friendly father, CEO of a packaging company, with a split personality, which is played by William Hurt. Demi Moore plays the cop chasing the serial-killer. The characters are played well, the story has little twists that will make you happy, and you'll be surprised how evil this movie really is. I can only recommend it to everybody reading this. Michael Moore on a new quest, and this time it's not a forgotten tale about what happened after a certain incident involving The Two Towers (*ahem*), but rather a story about the American health care system and what it looks like compared to other nation's health care systems. Let's be honest though, we all know the documentaries of Mr. Moore tend to dramatize a bit in favor of making an emotional impact on the audience. That said, it was pretty shocking to hear about how Americans are getting their money sucked out of their pockets and eventually in some cases being sent into a debt trap. The movie provides a fascinating look into the health care systems of various countries and never fails to entertain. Just don't take every presented fact for granted. On the search for the Allspark, which is basically the one-thing-to-rule-them-all - and a terrible pun - the Autobots and the Deceptions - currently at war - infiltrate the earth. Meanwhile the high-school student Sam Witwicky buys his first car, which coincidentally is one of the Autobots. There's a - really stereotypical - girl Sam wants to impress with his new car and drives her home. Wait, before I continue, here's a little history lesson. Sam's grandfather was a scientist and somewhere on the North Pole the Deception robot leader Megatron had been lying around frozen, but that didn't stop the robot from shooting a ray at Sam's grandfather's head, somehow inscribing a map of some sort in grandfather's glasses. Back to the present. Sam somehow got these old glasses in his possession and in a desperate attempt to make some money he puts it on - wait for it - ebay ... The Autobots find Sam through the auction on ebay and ... Excuse me for not telling the rest. Honestly, the transformation scenes are a joy to witness. I also loved seeing an actor who played a magician in one episode of Sliders' third season getting stabbed by a scorpion transformer. Everything else's just a letdown. There's a bad script and bad actors. Character development is nonexistent. Chev wakes up one day, all dizzy, finds a disc, puts it into the DVD player and turns it on. The guy on the TV screen shows how Chev was drugged with a needle right in the neck. Apparently a Chinese cocktail that decreases the beats per second of his heart to zero sooner or later - unless he keeps up the adrenaline. Chev swears, kicks the TV and sets out to kill the guy who did this to him. Obviously inspired by games like GTA (it even shows a pixelated version of the movie after the credits) the movie is a thrilling and fast-paced experience with a lot of style. The story is not the best, and Chev's wife is an extraordinarily two-dimensional character (almost like a comic-relief story device), but knowing that the movie isn't to be taken seriously you'll get a movie full of comedy, satire and satisfying action. Just when stretch-man and invisible-woman are about to marry, from outer space a silver figure on a surf board interferes by making huge holes into the planet. The Fantastic Four assemble once again to find out what drives Earth's latest enemy. There isn't a lot more story to tell (apart from one or two minor spoilers). Generally the movie is predictable, and sometimes the effects could have been a lot better (especially in a certain dance scene with Mr. Stretch). Still, I think this one's recommendable as long as you don't expect too much. I though it was at least better than Transformers. Nick Powell is a guy who gets most things right. An outsider, and yet somehow liked by everybody. One day he helps out his best friend by paying back some money his friend owes a girl called Annie, who's one of the most annoying bullies around. Later Annie and her boyfriend steal a car and some jewelries. Her boyfriend hasn't really agreed to taking the jewelries, so they argue, Annie leaves and he calls the cops. The next day Annie gets arrested in school. Meanwhile Nick plans to fly to England and leave everything behind to start a new life, but his mother wouldn't let him go. Annie, curious who told the police about the robbery, threatens Nick's best friend until he finally says that it had been Nick - thinking that Nick had left for England, thus making it safe to say Nick called the cops on Annie. However, that not being true, Annie catches Nick - and kills him. From this moment on Nick wanders the world as a ghost, trying to find out why he was killed and set things right. And honestly, that's when the movie starts to become really interesting. Nick can move things, but only in his mind. Meaning that when Nick throws a glass off a table, one second later it's back where it has been before. This is done with very well thought-out camera tricks. That's what I really enjoyed - not being fed the latest benchmark of 3D rendering, but clever tricks that actually work. I'm not saying that computers weren't used to aid in certain scenes, but you don't see the glass "fall back" on top of the table, instead it's off the screen and then it's back on the table. Also, if you remember Due South and Callum Keith Rennie as Ray's "incarnation" (who didn't prefer the original Ray anyway? ), you'll like seeing Callum appear as the Detective trying to uncover the truth behind the murder. I have to admit, it all sounds and feels like a movie targeted at teenagers. But the music's good, the main actors are great (maybe except for Annie) and the story is actually quite neat, if slightly predictable. I'm sure if you don't expect to much you'll get some enjoyment out of this film. Spiderman comes in contact with black ooze from outer space, making him some kind of Marilyn Manson fan. He kisses another girl because he thinks he's cool, and pisses off his girlfriend. Another guy - accidentally - falls into a Particle Physics Test Facility (those things are everywhere nowadays) and gets pulverized. To quote a chasing police man: "Where'd he go?" Thankfully, the pulverized guy has enough brain power to control everything that is sand now. Sandman. Meanwhile Spiderman fights with the black ooze, rings a bell and the ooze falls upon some competitive newspaper spiderman photographer standing below him, making him a black Spiderman, the now called Venom. There's a third villain who loses his memory. The guy we may remember from the first two films. Or not. And it's all going to drag through more than two hours. But of course, the battle scenes are exceptionally well done. If you crave films containing black humour, this should turn out to be a feast for you. A delicate satire. Evan, the news reporter Jim Carrey made fun of in Bruce Almighty, is god's next victim. This time however Morgan Freeman doesn't grant almighty power, instead Evan is told to build an Arc - just when Evan was trying to go into politics. Evan soon finds out that struggling against god's will is probably not such a good idea and that there's more to discover than meets the eye. I was surprised to see John Goodman. The film is a bit dull in general - with sometimes really terrible jokes and slapstick moments thrown in - but John and Morgan Freeman seem to cast a brighter light on the show. The ending sequence is nice, but I guess after all Evan can't reach Bruce's level. As one of the best hit men, Ben Kingsley screws up big time because of his alcohol problem. He's told to take a few weeks off, get a part-time job at the mortuary and join the Anonymous Alcoholics. Luckily he finds a woman who's going to help him get in shape again to return and settle old scores. Both Ben Kingsley and Téa Leoni play their characters well, making the movie enjoyable. It's just not one of those stories that will stay in your head longer than five minutes after the credits rolled out. If you enjoy Ben's acting, you should check this one out. Otherwise, you can live without seeing "You Kill Me". The whole cast is back to get a bunch of important pirates to help fight against other people and see if the audience still cares. Well, after being fed the absolute effects apocalypse they sure will care. When the credits roll all they talk about are the awesome scenes with superb effects. And oh yes, I think there was a Will Turner and a Jack Sparrow (sorry, CAPTAIN Jack Sparrow) somewhere. But you'll have to dig through all the CG layers to see some characters. Don't be surprised if you only find underdeveloped shells though, or fall asleep while digging.